Battery - Lithium Iron - Not Without Problems! After approximately 8 weeks of winter hybernation and not being used, the voltage had dropped to less than 2 volt, i.e. the battery is destroyed! The load during this time has been for the motorcycle and an add on burglar alarm which only draws arround 3.3 mA. The burglar alarm consumption over 8 weeks is thus arround 3.3*24*7*8/1000= 4.4 AH, i.e. much less than the capacity of the battery which is 14 AH. I have not yet measured the current drawn by the CBR so I do not have the final conclusion yet, but I suspect that the battery has not had the specified capacity. 2.4 kg lower weight - fantastic! 2011-11-07 11 - 15 weeks Problems! Blinking xenon light and after a couple of weeks no crancking. Stator was fried and battery voltage was down at 10.2 Volt. 2011-11-14 16 weeks Continued problems! The fried Stator was replaced free of charge by Honda, but the xenon lights continued blinking, charging voltage was high and unstable, going as hight as 15.5 Volt!. Switched back to the old lead-acid battery, and operation returned to normal with constant charge voltage at 14.2 Volt @ 2500-7000 rpm, and stable xenon-lights. Furter tests on the lithium-iron battery showed excessive charging voltage and very high self discharge. Clearly the battery was sick. 2011-12-05 18 weeks Shorai replaced the lithium-iron battery free of charge, so when spring comes, I will install the new battery and the test will continue. I can not conclude from the error symptoms described in the above table, wether it was the stator or the battery which was the cause of failure. Given the rather misserable failure statistics of the CBF1000 stator, my best guess is that the stator was the initial cause of failure, and that the consequent deep discharge of the battery caused this to fail also (Shorai specifications say "Do not allow discharge below 13.0 Volt"). 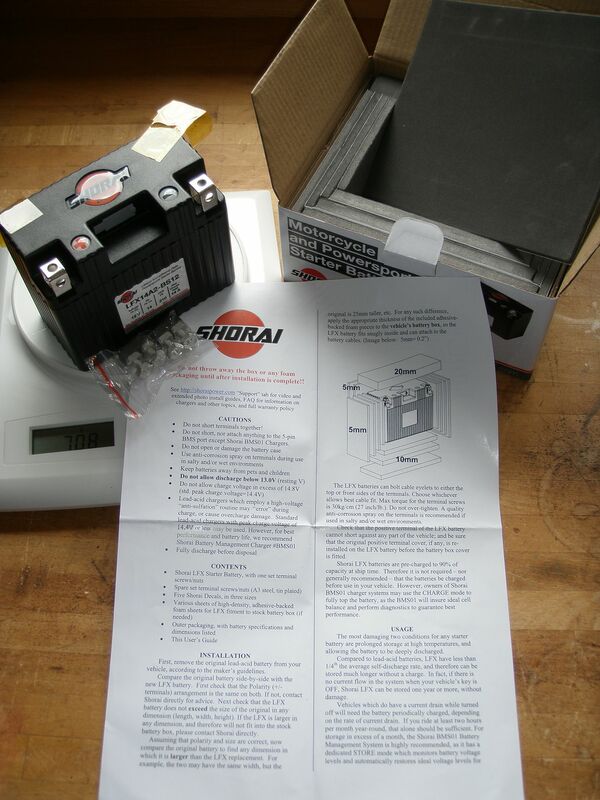 The Shorai European distributor has told me that the latest shipments of batteries (post september 2011) have different chemical composition and internal design and expectedly improved reliability. In october I also installed Shorai lithium-iron batteries in my CBR1000RR08 and in my wife's GS500F09 and theese show perfect operation. The charge voltage on the CBR1000RR08 is 14.3 Volt @ 1500-7000 rpm. 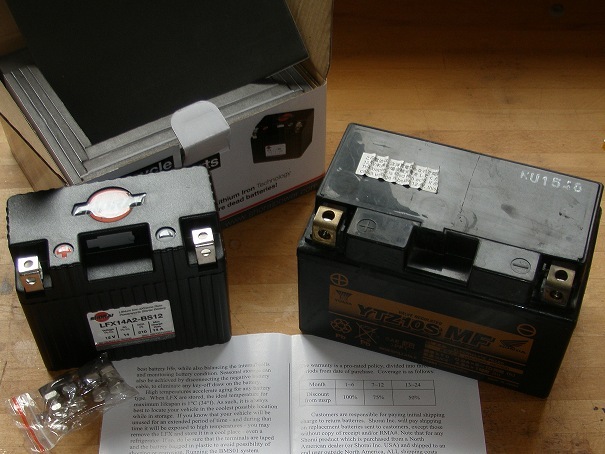 Lithium iron phosphate (LiFePO4) batteries (also called LFP -, LiFe - and LiFiPo batteries) were discovered in 1996, so it is a rather new technology which has now matured into astonishing small and light-weight replacements for the old lead-acid types, offering tremendous improvements in power per weight, power per volume, service life, self discharge, safety, and environmental aspects. The table below shows how the LFP battery for CBF1000 compares with the standard lead-acid type. The high Cold cranking amperes (CCA: the current the battery can provide at 32 degree F or 0 degree C) is possible because the inner resistance of this battery type is very low. This also means that the chargeing current in some systems with field regulated generators may reach very high values, exceeding the specified limits (e.g. older Yamaha and BMW R-series). The Shorai LFP battery is designed as a drop-in battery for the lead-acid type an is hence able to operate with the voltages and currents comming from the rectifier/regulator. 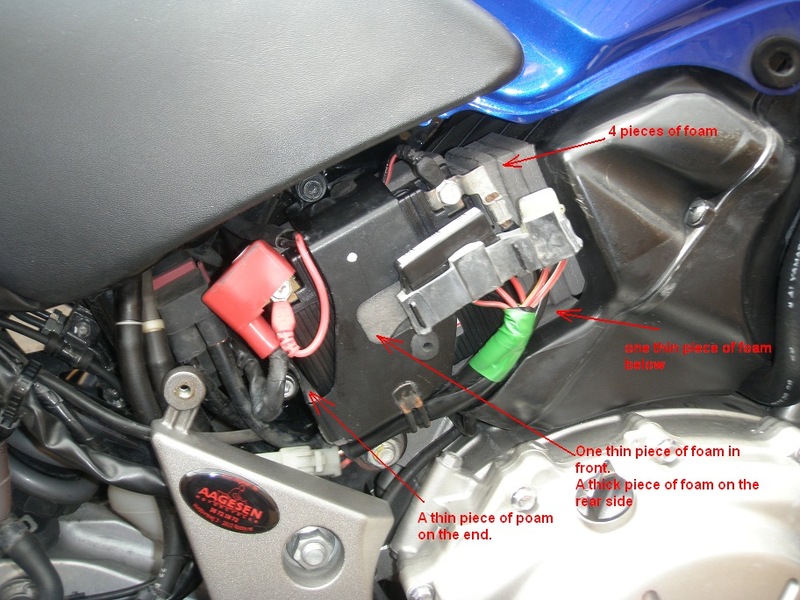 Due to the very low self discharge of the Shoray battery, you should really never have to use an external charger, unless you leave the bike with ignition on and engine off. If you anyway need to use an external charger, Shorai recommends to use their own charger, but this is not really nessesary. You just need to make sure that the charger you use will not exceed the 14 A maximul allowed charge current and that you do not engage any high-voltage "anti-sulfatation" mode. The CTECK Multi XS 7000 charger I use is specified to give maximum 7A charging current, so that is well widthin the 14A max for the battery. I measured the initial voltage on the battery to 13.3 Volt. 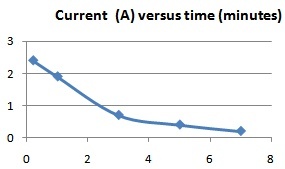 The chargeing current versus time is shown below. After 7 minutes the current had dropped to 0.2A at which time I measured the chargeing voltage to 14.1 Volt. This is a very easy DIY task. A first timer may spend 2 hours or more doing it, an experienced might do it in 30 minutes. 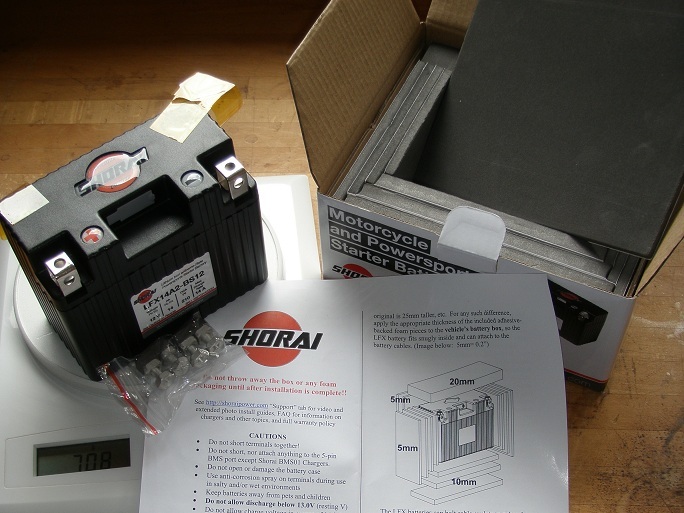 Shorai LFX14A2-BS12 Lithium Iron Motorcycles and Powersports Starter Battery. 1.0 Remove the old battery: as described in this DIY article. 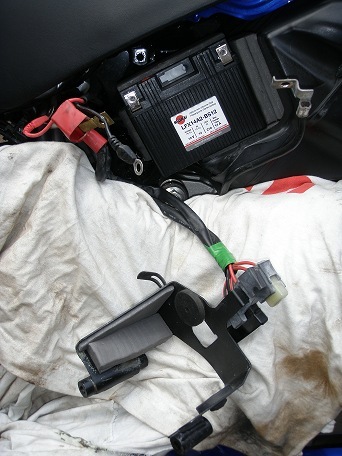 Notice: You actually don't need to remove the rubber fuse box from the battery holder. You can just leave it hanging in the wires as you can see on the third image from left here below. 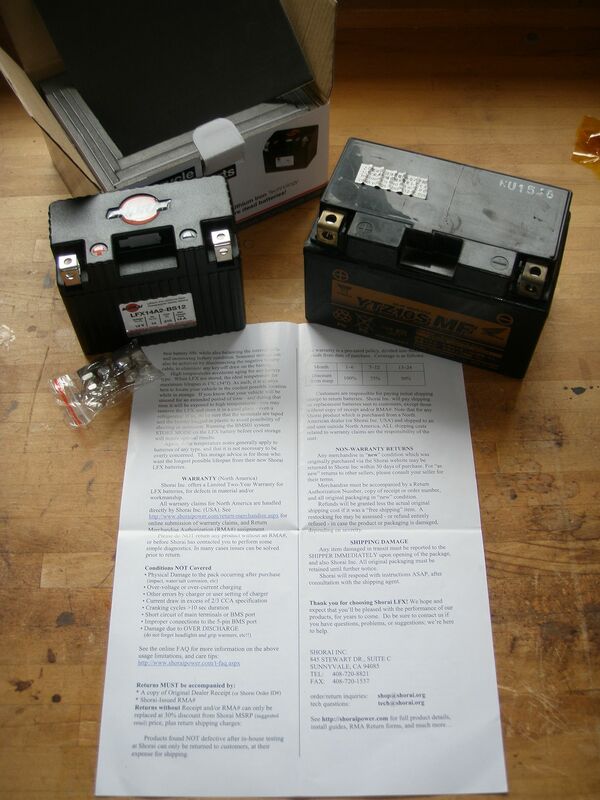 The lithium iron battery is much smaller than the Yuasa YTZ10s battery which came with the bike when it was brand new. You must hence use some of the foam pieces which is delivered with the batter to build a nice little nest for the new battery. The foam pieces comes in different thickneses and adhesive for easy mounting. Clean the surfaces with e.g. gasoline to be sure the adhecive attaches correctly. Click on the rightmost image below to see details on this, and notice that I have made sure not to place the positive terminal too close tho the battery bracket, so that we do not create any shorts!. Just turn on ignition and start up the engine. Your bike is now 1% lighter and 1% faster on accellerations than it was before before! Two days after the installation I went for a +500 kms tour arround in Denmark with several stops, and each time the starter moter was crancking very fast and the enginge sprang into life instantly. As time goes I will update the article with reports on how the lithium iron battery behaves. The thread Lithium Iron Battery Installation DIY Article on www.cbf1000.com may be used for comments and feed back, or you may mail directly to me (mail addres is on the front page).